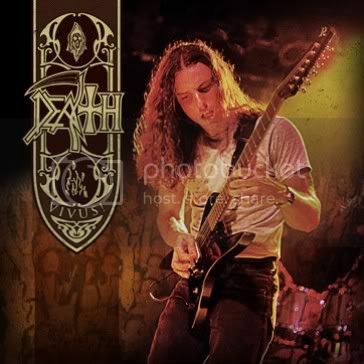 DEATH - Preview Every Song From Vivus! On February 28th in North America, March 2nd in the Benelux / Germany, and March 5th in the UK and rest of Europe, Relapse Records will issue a deluxe live 2CD DEATH collection featuring two separate Death concerts, titled Vivus! Each of the 24 songs featured on Vivus! can now be previewed on iTunes. Both shows contained on Vivus! were recorded in 1998. Disc one features the band at the height of their prowess tearing the roof off of the infamous Whisky A Go Go in Los Angeles, while disc two is a brilliant recording of the band on the festival stage at Dynamo Open Air. This collection will contain extensive liner notes from Death insiders and never-before-seen photos of the band.